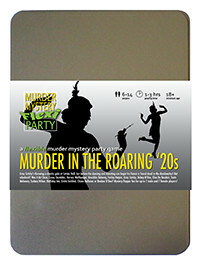 You've been invited to play the role of SYDNEY HILTON in Murder in the Roaring '20s. Gray Catsby has invited his most talented and wealthy friends to a charity gala event at his countryside residence, Catsby Hall. But before any dancing and donations begin, Catsby’s fiancée, Ginger Whiskers, is found dead in the dumbwaiter! Join the flappers and dappers to find out who finished her off! Your short blonde hair is fashionably permed and complemented by a braided tiara. You’re a big fan of Wedgewood and wear blue- or green-and-white dresses that match your rings, brooch and necklace - but not your black armband. Your mother was a writer and your father was head of a global consortium. Consequently, you spent a lot of your childhood in a big empty mansion playing by yourself. Luckily, you had no end of dolls to keep you company. Now you’re too old for dolls, so you’ve had to find something else to be your emotional crutch. I’m Sydney Hilton, the original BYT - that means Bright Young Thing for all you wet blankets! If it’s in fashion, I’m either wearing it, doing it, or drinking it. But you must excuse my black armband. I’m in mourning for my beloved Gregory. It’s only been a year and I still grieve for him with all my heart. Oh, and it’s a terrible shame about Ginger. I wish we’d had the chance to sort things out. Now it’s too late.